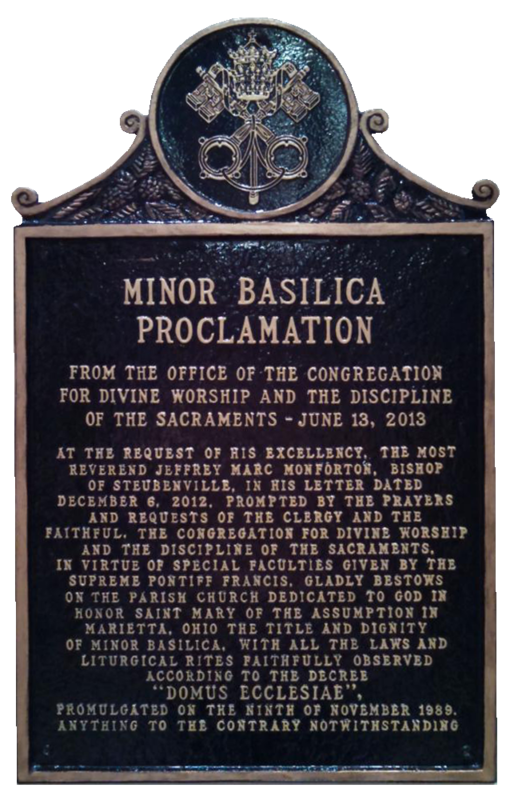 The title Minor Basilica was conferred upon the Church of Saint Mary of the Assumption on June 13, 2013 by the authority of the Holy Father entrusted to the Vatican Congregation for Divine Worship and the Discipline of the Sacraments. The bestowal of the title initiated a very particular bond between the church and the Holy Father and set the church apart in rank from other churches. While the principal church of the Diocese of Steubenville is Holy Name Cathedral, where the cathredra is found (the chair of the Bishop, the symbol of his authority), our Basilica ranks after the Cathedral as a church of great distinction. promulgated on the ninth of November 1989.